lisa bought us chinese food for dinner. (she's generous like that.) 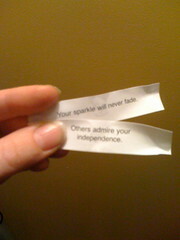 I actually like the taste of fortune cookies very much, but this time i actually got good fotunes too- "others admire your independence" and "your sparkle will never fade!"